We all know the look students give us when we put sheet music in front of them when they don’t know all of their notes. They are filled with fear! It’s not just the “deer in the headlights” look – it’s the “piano student in quick sand” look. I created the 7 Markers of Musical Success so anyone who is having trouble learning to read notes on the piano can quickly and easily identify these seven notes and start reading music. This is an effective way to quickly and easily learn to read music. I have found, in my own teaching, that all of my students young and old alike remember these 7 notes after I teach it to them. For me, I decided to tell a story they could remember. Watch this video as I teach the 7 Markers of Musical Success and you will see how simple it is to learn and identify these notes and then quickly learn the other notes on and off of the grand staff. This is a simple way to help piano students know their notes once and for all. With my own piano students, I teach them the story and then ask them to teach it to me and two or three other people so they will know the story by heart. This helps them forever remember these notes. Click on the video below and learn these 7 Markers of Musical Success. 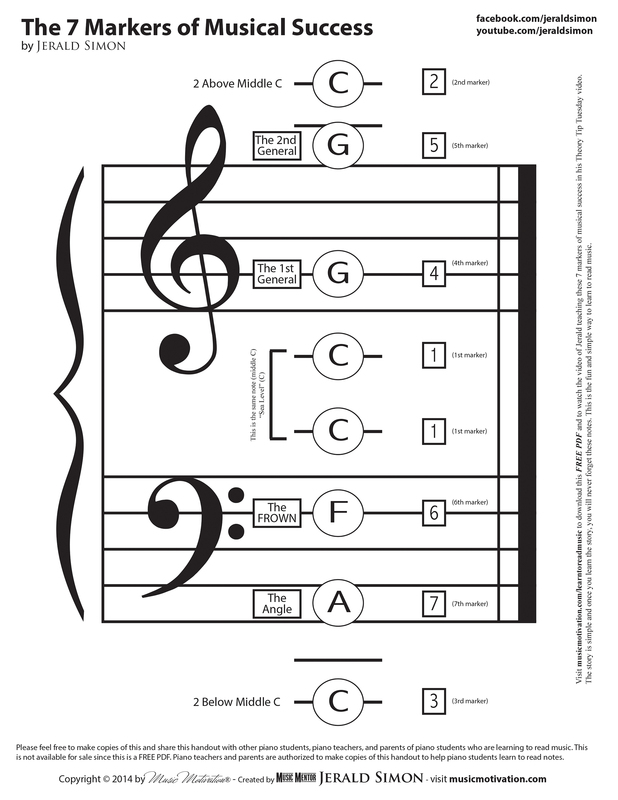 Once you learn these seven notes, you can quickly identify the neighboring notes on the staff. On the very first lesson I ever give – even to young children who have never played the piano before, I tell piano students this story and they quickly understand the concept. If you know other piano students, piano teachers, or parents of piano students who would enjoy this video and benefit from watching it, please share this with them. I tell my own piano students to watch this every day for a few weeks until they know these seven notes and have the story completely memorized. I have also had students who began taking lessons from me and had never learned to read music from their previous piano teachers. I had been told by their parents and their former teacher that the student could not read music despite their best efforts in teaching them to do so. They had tried everything and had taught them the familiar sayings we all have heard before, but nothing would work. The student could not grasp the concept or transfer the information to the practical application of reading music. Once they learned the 7 Markers of Musical Success, they quickly began identifying these seven notes and could then identify the surrounding notes as well. I hope you enjoy this! Click on the image below to download the FREE PDF worksheet of “The 7 Markers of Musical Success” by Jerald Simon. Please share this with anyone who would enjoy this and benefit from it! This FREE PDF download is a six page PDF that has the page below exactly as you see it, the same page with blank circles so students can practice filling in the note names on their own, and also four pages that describe the story I tell written out so you can teach it to yourself or your students.